Gig Harbor WA Salt Waterfront Home for Sale. 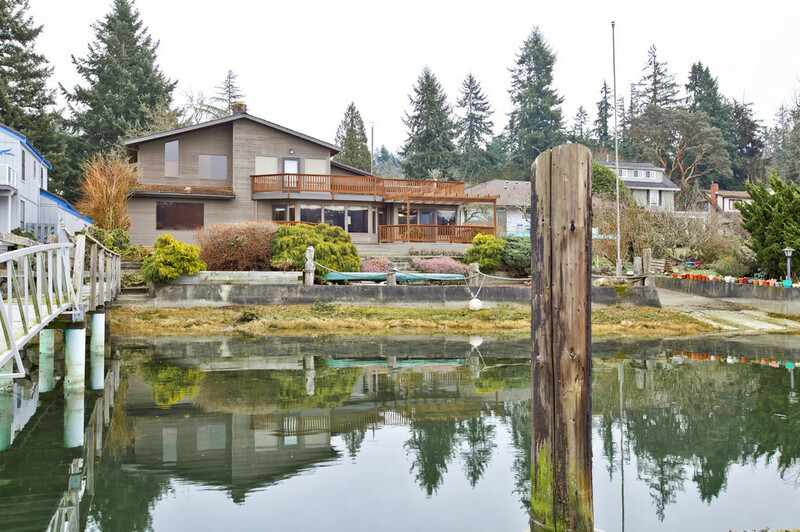 Gig Harbor Bay—75 feet of no-bank sunny Western exposure from this salt waterfront home for sale. …For the boater—both private small power boat dock and boat launch. 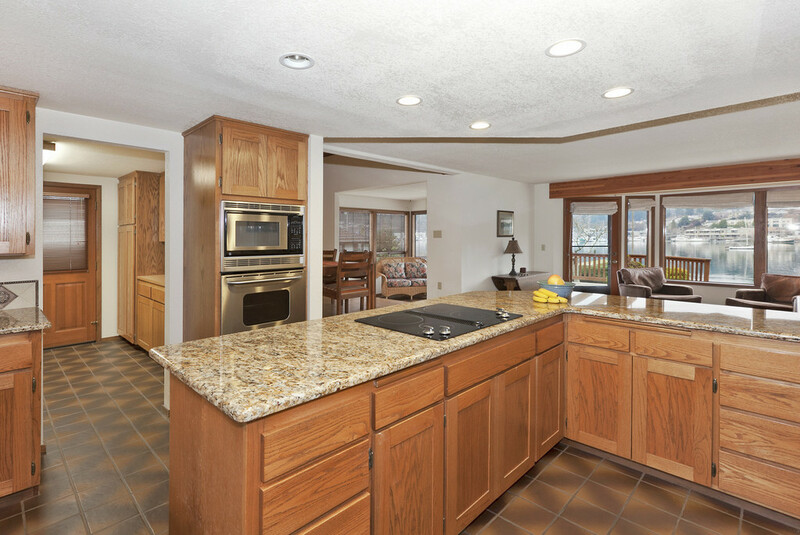 …For the entertainer—both spacious deck and level brick patio and lawn for games and leisurely dinners. 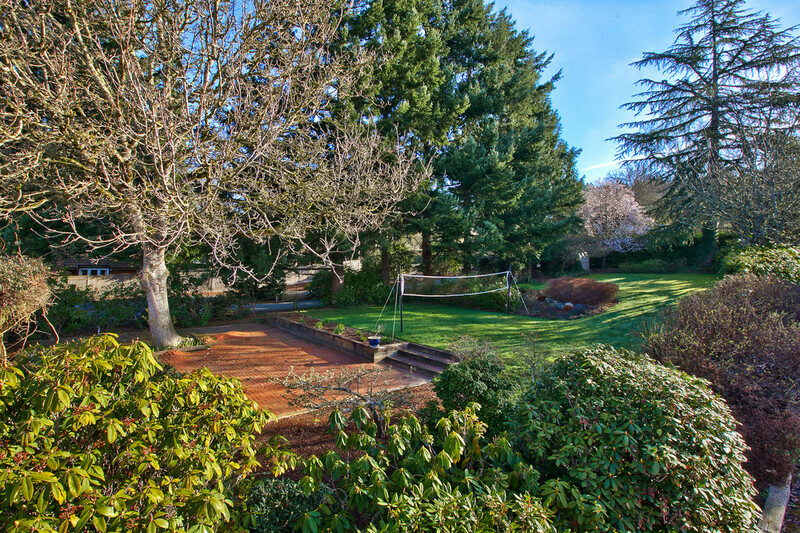 …For the gardener—all-day sun and spacious yard. …For the hobbyist—double car garage and third car garage attached to shop. 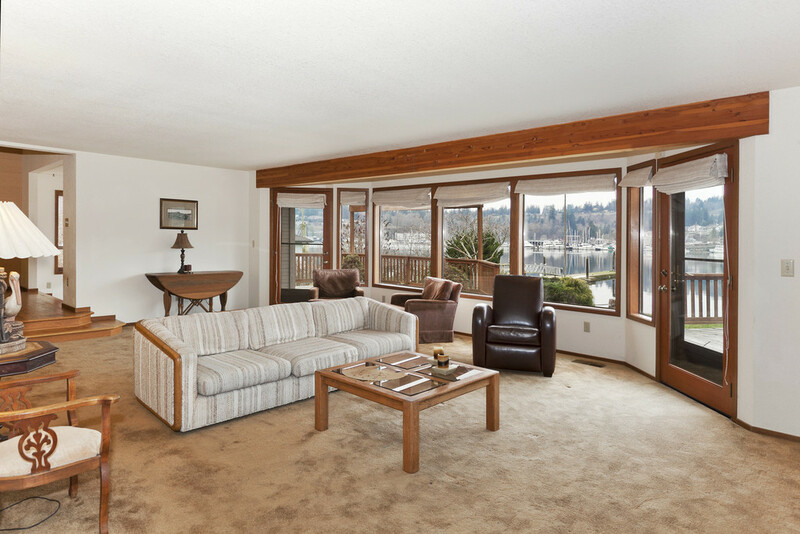 …For those who just want to enjoy the activity and view of Gig Harbor Bay—2850 square feet salt waterfront home for sale with three bedrooms— on a generous half acre of backlands plus tidelands rights. All just two blocks to city limits, parks, walking, restaurants and shopping. Call me at 253.549.6611 or email me Carole@GigHarbor-Waterfront.com for more information about this or another salt waterfront home for sale. Or click on www.GigHarborBayHome.com for more photos of this salt waterfront home for sale. Gig Harbor was named during the 1841 Wilkes expedition after a crewmember in a small boat, called the captain’s gig, sighted a harbor and led other boats exploring in the area to take refuge in the harbor during a storm. When the first European-American settlers came to the harbor in 1867 there was a Native American village, with longhouse, located at the head of the harbor near a small creek. In 1867, two Slovenians and a Portuguese rowed a skiff south from British Columbia to fish. They entered Gig Harbor by accident to seek shelter at night. Samuel Jerisich liked the area and decided to stay. He married a fifteen-year-old native woman from near Vancouver Island and settled in Gig Harbor, becoming the first European-American settler in Gig Harbor. Soon Yugoslavians, Germans and Scandinavians followed to settle in the harbor. A major boatyard, lumber mills, salmon fishing fleet and farming provided the early economic base for the town. In 1886, the Indian longhouse served as the first school. Later, the Indian village became the site of Austin mill. Chicken farming prospered in the 1920s and 1930s. Early fishermen used rowboats to fish. Later, motorized boats allowed fishermen to fish in Alaska and the San Juan Islands starting around 1905. The town incorporated as a fourth class city in 1946 because of the need to provide for water and sewer systems. Gig Harbor was home to a fishing fleet of more than 70 vessels in the 1970s that decreased to 30 vessels in the later 1980s. The Skansie Shipbuilding Company was founded in 1912, producing four-to-five boats per season with 25 to 30 employees. The company built a variety of boats including ferries and wooden fishing boats. One of four Skansie brothers operated the Washington Navigation Company, which operated ferries around the Puget Sound in the 1910s until the 1940s and for the State between the time the first Narrows Bridge collapsed and the second Narrows Bridge was constructed. Lumber was one of the early industries in the area. The first mill in Gig Harbor started operating in 1887 on the west side of the harbor with two others in the early 1890s and in 1909. Many early settlers engaged in farming, including apples, pears, loganberries, holly and chickens. Area residents have consistently demonstrated their strong commitment to provide a high quality public education to nearly 10,000 students. The district enjoys a statewide reputation for meeting the educational needs of today’s students who become tomorrow’s leaders. In addition, Gig Harbor has nearly a dozen private schools. The Harbor History Museum is located on Gig Harbor Bay and allows visitors a place to experience the history of Gig Harbor. In 2010 the Museum opened its new multi-million dollar facility, highlighted by the Shenandoah, a purse seiner built in a Gig Harbor shipyard and the Midway schoolhouse. The Midway Schoolhouse Experience may be the only all-day pioneer classroom experience on the West Coast. It has been designed with actual curriculum and is the buzz of all 4th graders who are given the option of attending. It is hosted by numerous volunteers and comes complete with “school marm”. The permanent gallery is spectacular and the temporary exhibits are diverse. While Gig Harbor was once most known for its fishing and logging, it is now also known for its numerous art galleries, art walks and art shows. A theatre company in Gig Harbor provides entertainment including dinner theatre and summer outdoor theatre. The Gig Harbor area is ideal for enjoying water-related recreation. Whether you prefer water skiing, power or sail boating, kayaking, fresh or salt water fishing, scuba driving, windsurfing, clamming, beachcombing or swimming, the secluded harbors provide excellent moorage and docking facilities. There are four state parks. Boat ramps are located near the major bays. Gig Harbor operates a waterfront park, a park on Crescent Creek, a boat-building facility and a pioneer farm. Eight golf courses offer year-round golf close to Gig Harbor. Numerous events are scheduled throughout the year, largely centered on the Gig Harbor waterfront, including farmers markets, outdoor cinema, Tuesday night music at the park, and lighted holiday boat parade. Youth and adult baseball, basketball, football, gymnastics, dance, and soccer programs are provided through community organizations. Two local pools provide swimming opportunities for the community and swim clubs. Gig Harbor waterfront experienced some strong signals at the end of the year. I believe the strong 4th quarter closings were due, in part, to savvy buyers picking up some incredible Gig Harbor waterfront buys–recognizing the bottom was nearing while interest rates were increasing. Key Peninsula is not providing its traditional 33% of sales—one big change in the market. Likely this is due to the Gig Harbor waterfront inventory pegged at prices not seen since 2004-05, allowing buyers to not drive the extra miles for “value”. A second change for Gig Harbor waterfront is bank-owned homes have become a part of even the local waterfront scene. 17% of all sales last year were bank-owned or short-sales, including three homes priced over $1m as well as five built since 2004. 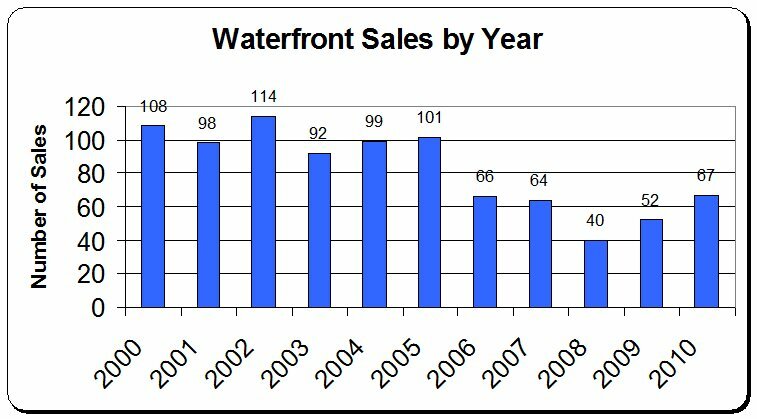 Gig Harbor waterfront homes took an excess of a year to sell–doubling 2009 figures and reflective of how slow the market has been. Homes originally listed at more than $1.5 took on average nearly 600 days before receiving a contract. Key Peninsula waterfront took a bit less time—315 days. 2010 was a reality check for sellers. Prices are down 25% from the 2007 peak and 17% from 2008, which was still a good year for sellers. Gig Harbor waterfront homes sold in 2010 for 79% of the original listed price. This figure would actually have been lower, if prior listings were factored in. Key Peninsula’s selling price to original price was 82%. 2010’s priciest Gig Harbor waterfront sale was a high bank estate in the Horsehead Bay area—for $2,350,000. Three of the other $1m sales came from the same area. This is “the season” for Gig Harbor waterfront. Inventory is down but a high percentage of this year’s buyers are already actively looking. March is historically the best month for written contracts, followed by May. Simply for Gig Harbor waterfront sales to be at the same level as 2007 shows the increasing strength of Gig Harbor’s real estate market. The first half of the year was down from the 2009 volume. But the Gig Harbor waterfront homes market picked up steam in July and again in September. The average yearly number of sales for Gig Harbor waterfront homes is 101–from 1998 through 2005. This number was consistent even during the recessionary early years of this decade. The low point was 2008 with just 40 sales followed by the second worse year 2009 with 51 sales. 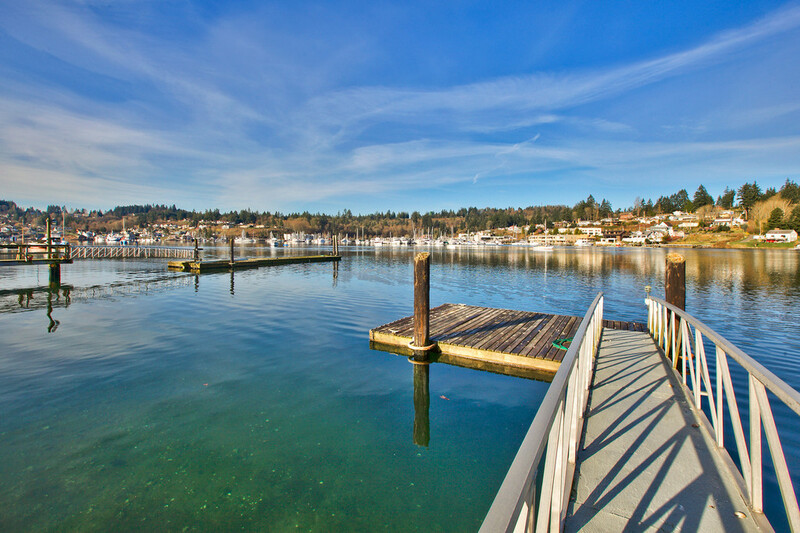 Nearly half of the current inventory of Gig Harbor waterfront homes is listed over $1m. This year’s median price—half the sales above and half below—may not climb much above the $682,500 figure from last year. A few months ago it looked like this figure might increase—but not now. But simply to not decrease is positive. 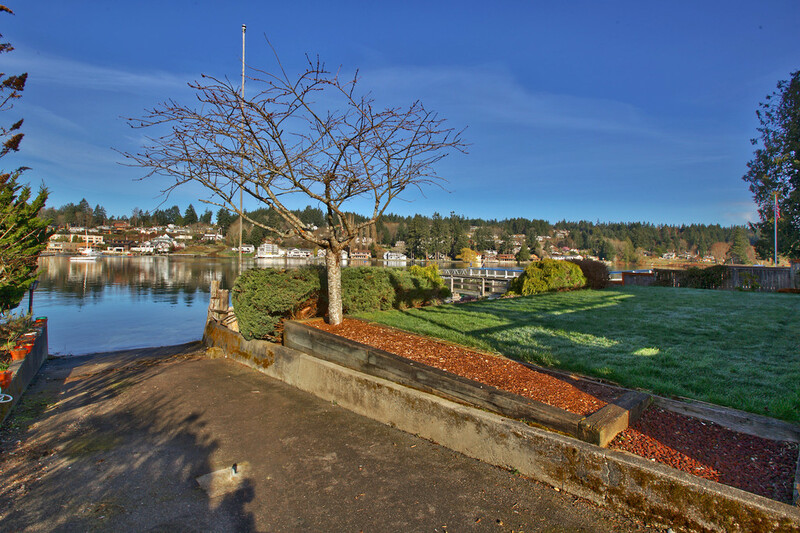 Normally Gig Harbor contributes two-thirds of the sales and Key Peninsula one-third. This year just 12% have come from Key Peninsula. I have to presume this is because buyers have had a number of less expensive options to chose from in Gig Harbor…and have not found it necessary to travel the extra miles to quality waterfront. Sales over $1m have strengthened this year with twice as many as last year. 11 homes sold up to $1,250,000 and six above that—but only one over $2m. Two or three is the most we ever have over $2m—but the range that has been hit the hardest is the $1.5-2m…there were 10 in 2006…and one this year. The median sales price for Gig Harbor waterfront homes as a percentage to assessed value is currently running 91%. In other words, homes are closing for 91% of the county assessor’s valuation. Homes over $1m actually sold for 104% of assessed value…a figure that changes dramatically under $1m. Carole Holmaas is a Managing Broker at Windermere Real Estate, licensed since 1968. she specializes in waterfront and view properties. She may be reached at 253.549.6611 or Carole@ISellGigHarbor.com.